Welcome to Fish Window Cleaning where we are committed to your satisfaction!We are your local window cleaning company for Baltimore, Laurel, Columbia, Elkridge, Hanover, Odenton, Jessup, Crofton, Glen Burnie, Severn, and Gambrills, MD. Clean windows make a huge difference in the atmosphere of your home! 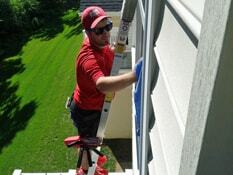 We not only make your windows sparkle, but we also clean gutters, chandeliers, mirrors, and more! We wear clean shoe covers in your home and use absorbent cloth pads under your windows as we clean to protect your floors. We lead the industry with a premier safety program to ensure the protection of our customers and cleaners. We even use environmentally-friendly cleaning products so you don't have to worry about harsh fumes around your family or pets. "I was very happy with our window cleaning. The team was professional and friendly. I was especially impressed and appreciative that they wore shoe covers while inside the house! Fantastic job!" We help maintain the appearance of your storefront or commercial building, giving your customers a great impression. Despite your budget, schedule, or specific needs, we can create a customized program for you. We offer flexible scheduling and cleanings ranging from weekly to annually. We clean quickly and quietly so we do not disturb your employees or customers. Our cleaners are licensed, bonded, and insured so when you choose Fish Window Cleaning, you have nothing to worry about. "Fish Window Cleaning of Jessup, MD is the best window cleaning company we've used in the 10 years we've been in business." We provide free on-site estimates for all of our services! Give us a call or click here to submit an online Estimate Form today!